Honor Guard Uniform Jacket by J. Higgins, Ltd. Pipe Band Supplies! A very versatile jacket for Fire Departments. Our Class A Honor Guard jacket comes with red trim collars and epaulettes, two front pockets, two inside pockets, two belt hooks and easy-to-remove buttons. Standard buttons are our gold thistle buttons, but you can order these with the gold hook and ladder buttons or even send us your department buttons and we'll put them on. You can also order without buttons and put yours on using our sleeve access for easy mounting. These doublets are very popular with Fire departments due to their attractive clean look and low price. It fit perfect and it looks just as I expected, I got it especially for the Robert Burns dinner next month and my wife things it looks perfect also, thank you! This jacket was well made and very sharp looking. I would be proud to wear one. The only problem I had was that the stock jackets are too short for someone over 6ft. They will custom make one but it will cost more. I was also very happy with the service I received. John's reply: Yes, this customer is 6'3" which is taller than our stock range supports, so if you are a similar height it would be best to have a special cutting which adds $100.00 to the $150.00 price. Our Fire Dept pipe band decided to go with a good light weight alternate dress jacket and we purchased these off the shelf. We sized ourselves and sent in measurements. The first Jacket I received was just a little snug at the shoulder and bicep area but I called the customer service line and got the next size up Jacket within 3 days. Excellent customer service and worked with us to get correct fit. This Tunic is well made and the help I received to get the correct fit was excellent. I purchased both Class A honor guard coats; one with red trim and one with blue trim. Very good quality and at an excellent price. 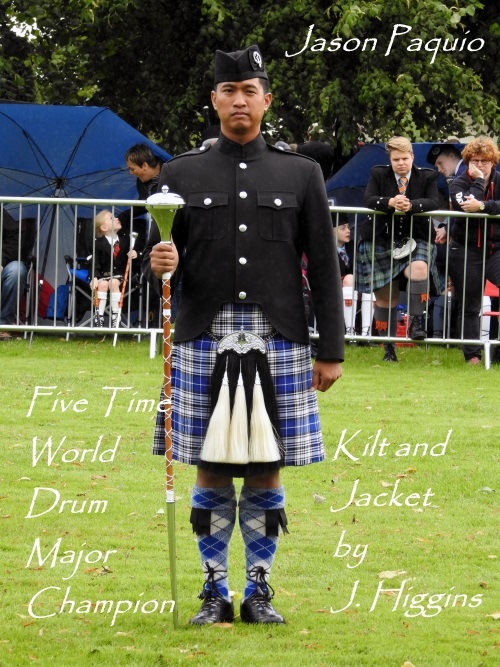 The blue trim coat would be excellent for police pipe bands. This company also has wonderful customer service. I've been very happy with my purchases from J. Higgins! When I was shopping for a class A style jacket this one caught my eye, and the price was unbeatable. John even noticed I was looking and volunteered to help with questions. He told me they were adding sizes and options and I decided to wait to get just what I wanted. I received it and it's much better than I expected. Great craftmanship and a good medium weight. It's fully lined and the silver buttons I chose really make it pop. The sizing is right on as well. I can't say enough great things about this whole process and I will come here first when I'm buying piping supplies and highland wear in the future. Great For That Solo Piping Gig! Best alternative of this type on the market today. Sizing was correct.